International travel is my favorite, but sometimes I think I need a trip and I don’t have a whole week or $1K to spend. That’s when I’m glad I live in eastern Pennsylvania. One of the best things about eastern PA is it’s proximity to other places. I live 5 minutes from the toll road, which can take me to lots of cool places, like New York City, Washington D.C., Pittsburgh, and Baltimore. So, when I first moved to PA and was ready for an adventure, my friend Allison and I jumped in my car and drove to Baltimore for the day. First we stopped in Charles Village to check out the pretty painted Victorians and get our morning coffee. 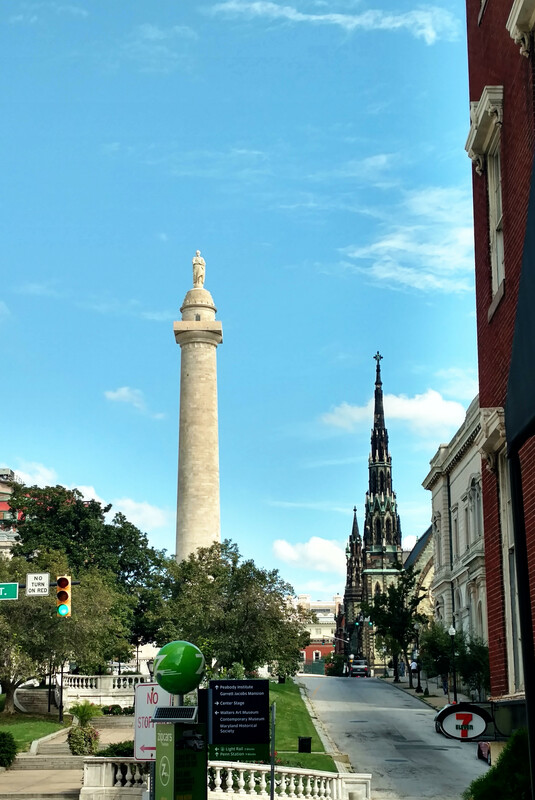 We did a drive by of the Washington Monument in Mount Vernon. Washington Monument, from the street. The main event of our day was the National Aquarium in the Inner Harbor. For aquariums I’d give it a 4.5 out of 5 stars. The only thing it lacked was one of those moving walkways under the sea. What it did have was a dolphin show, plenty of fish, and even a chance to pet a jelly fish! Not the jelly fish we petted, but still cute. After the aquarium we headed across the road for some Shake Shack. I got my standard Shackburger, fries, and shake, of course. We ended our day in Baltimore with a walk along the Inner Harbor and a chat on the benches with a perfect view of tourists attempting to paddle boat. If you live within a 3 hour drive it makes for a nice day trip and adds some variety and needed urban-ness to your life. The aquarium is definitely worth a visit if you like family friendly and fishy. It’s walkable, which is great because free parking is just a long (but not impossible) walk from where you want to be.